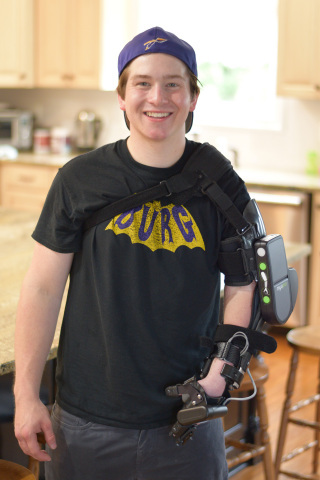 CAMBRIDGE, Mass.--(BUSINESS WIRE)-- Myomo, Inc. (NYSE American: MYO) (“Myomo” or the “Company”), a wearable medical robotics company, today announced that its MyoPro myoelectric arm orthosis (powered brace) is now available to adolescent patients with paralyzed or weakened arms. MyoPro is the only lightweight wearable device on the market that can help restore substantial functionality in the arms and hands of individuals who are suffering from the effects of a neuromuscular disease or injury. Myomo originally developed MyoPro to assist adults suffering from brachial plexus injury (BPI), brain or spinal cord injury, stroke, multiple sclerosis or ALS. MyoPro is now available to help restore upper limb functionality in adolescents with similar neuromuscular conditions. In order to facilitate MyoPro fittings and delivery to adolescent patients, Myomo has partnered with Easterseals DuPage & Fox Valley (Chicago area), one of the largest and most highly regarded pediatric outpatient rehabilitation centers in the nation, and is exploring partnerships with additional youth institutions and children’s hospitals that are committed to providing innovative care to adolescents and children with specialized needs. Based on patented technology developed at MIT, MyoPro is a powered brace that senses a patient’s own EMG signals through non-invasive sensors and restores function to the paralyzed or weakened arm. This allows MyoPro users to perform activities of daily living including feeding themselves, carrying objects and doing household tasks. Many adult patients are even able to return to work. For more information about MyoPro for adolescents, please visit www.myomo.com/adolescents. Myomo, Inc. is a wearable medical robotics company that offers expanded mobility for those suffering from neurological disorders and upper limb paralysis. Myomo develops and markets the MyoPro product line. MyoPro is a powered upper limb orthosis designed to restore function to the weakened or paralyzed arms of patients suffering from CVA stroke, brachial plexus injury, traumatic brain or spinal cord injury, ALS or other neuromuscular disease or injury. It is currently the only marketed device that, sensing a patient’s own EMG signals through non-invasive sensors on the arm, can restore an individual’s ability to perform activities of daily living, including feeding themselves, carrying objects and doing household tasks. Many are able to return to work, live independently and reduce their cost of care. Myomo is headquartered in Cambridge, Massachusetts, with sales and clinical professionals across the U.S. For more information, please visit www.myomo.com. This press release contains forward-looking statements regarding the Company's future business expectations, including the availability of MyoPro for adolescents and potential benefits of MyoPro in increasing or restoring function in its users, which are subject to the safe harbor provisions of the Private Securities Litigation Reform Act of 1995. These forward-looking statements are only predictions and may differ materially from actual results due to a variety of factors. Our actual results could differ materially from those anticipated in these forward looking statements for many reasons, including, without limitation, risks related to regulatory approval and market acceptance of our products, and the other risk factors contained in our filings made with the Securities and Exchange Commission. More information about factors that potentially could affect Myomo's financial results is included in Myomo's filings with the Securities and Exchange Commission. The Company cautions readers not to place undue reliance on any such forward-looking statements, which speak only as of the date made. The Company disclaims any obligation subsequently to revise any forward-looking statements to reflect events or circumstances after the date of such statements or to reflect the occurrence of anticipated or unanticipated events.